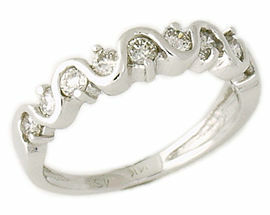 10 Stone Diamond Wave Band in 14K Solid White Gold. 10 fiery round diamonds alternate around an "S" like rope of 14k white gold. An impressive and unique prong set design. A special ring for that very special person. 10 diamonds weigh 0.50 ct.tw. Color H-I, Clarity SI. We guarantee our 10 Stone 1/2 Carat Diamond Wave Band in 14K White Gold to be high quality, authentic jewelry, as described above.